We just had a video call on Skype tonight with everyone at Lanette's brother Kreg's house (including Lanette's parents who happened to be there). It's just amazing that we can hear and see them from our computer - and it's a free call from anywhere in the world. Having this option for communicating with family really makes a difference in thinking about physically being so far away, although nothing absolutely replaces a face-to-face conversation. There are other services available now, but we've been using Skype. It does audio conferencing, and if you have a webcam it can do video conferencing (only one-to-one). You go to their web site and sign up for a Skype account for free and then you can call anyone in the world for free computer-to-computer as long as both parties have the free Skype account. You will want to check the Skype site for details on minimum requirements for your computer and your internet access. I'm using the built-in video camera on my MacBook Pro laptop. We bought a Logitech QuickCam Communicate STX webcam for Lanette's Mac PowerBook G4. It's listed for $49.99, but I found it for $39.99 somewhere online. A hint for others using Macintosh computers: Even though the packaging of many webcams claim they only work with Windows systems, the free software macam can make just about any webcam work just fine on a Mac. Before buying your webcam, check the list of compatible webcams at the macam web site. For those willing to experiment, I've been dabbling with some other web conferencing options and wouldn't mind finding others to try some of these with me. I'm keeping a list of options like these and more in this site's Web Links area. What are the chances of this connection? At a meeting with our Thrivent Financial rep on Monday, she happened to mention an Australian who works at a nearby Lutheran church. I asked what his name was. Amazingly he had the same last name as the principal of the school I'll be teaching at in Australia. (This principal has been my main contact at the school.) It ends up that I then contacted him through email and found that he is a first cousin of the principal. He has been here in the US for many years, and currently he and his wife are on the staff at a Lutheran church no more than 2 miles from where we are living now with my mom. We met for lunch yesterday and had a very enjoyable conversation. Their fathers were both Lutheran pastors, and they and other siblings have found themselves following in their footsteps as Lutheran churchworkers. Not so different from my family tree. On my maternal side, I am a 4th generation churchworker; 2nd generation on my father's side. I have more than a few aunts, uncles, and cousins who have been in churchwork. Similar to this story of this principal's family story, my father and my uncle were both encouraged to leave the family farm to work for the church. It's a small Lutheran world after all. Recently, as the story was relayed to me, Lanette's parents and her brother Kurt were discussing the matter of when would be a good time to visit us in Australia (once we get there, of course!). Different months and seasons were suggested, with no one in favor of arriving during the heat of summer in January and February. When Lanette's mom suggested May, she realized she'd miss the opportune time to plant the garden. If she didn't get her pink flowers planted, she wondered if people driving by who knew her annual routine would think she'd passed away. To offer an explanation to those driving by, Kurt suggested that she could leave a sign in the garden - "No Flowers - Down Under" - not realizing at first that such a sign might actually confirm what those driving by would already be thinking! At Christmas, we thought we'd be here only a few more weeks, but now it's Easter. 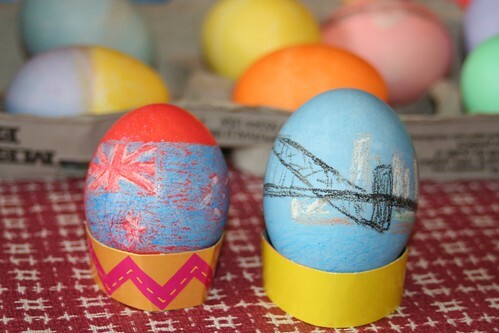 We're glad to be around family and friends for the Easter celebrations, but as you can see from our Easter eggs (photo), our thoughts at times are about 10,460 miles away. The latest news is no news really. On 17 March, we received an acknowledgment that our visa application packet had been received in Perth. The immigration people have a policy to not offer updates on the progress of an application, so all we can do is wait. The hints we've had suggest approval between now and the end of April. We think it would take us up to 2 weeks to make our final departure arrangements and be on our way. The second school term begins over there on 28 April. Our shipping container arrived in Perth's port of Fremantle this week. Without our visa details, it can't clear customs. It's being held in storage in the meantime. Since it hasn't actually arrived at the house, I think we're still in the race to beat our stuff. Reprising the role I last played in 8th grade as the Tin Man, this photo depicts the scene today as we received word from the Wizard of Oz (our Aussie immigration case manager) that we indeed can book our flights for leaving for Australia on Saturday, 26 April. Just as in the classic motion picture, we eliminated the wicked witch and her flying monkeys and today returned with her broom thereby completing all of the criteria set forth by the Wizard for obtaining a work visa. Hopefully, this more recent 3-month drama of waiting for visa approval won't leave us with a lifetime of nightmares as the 1939 version did for some of us. On Thursday we will book the airfare that we've had on hold with our travel agent. Departure will be Saturday afternoon on the 26th. Thirty-nine hours later we will land in Perth at about 6 PM on Monday (with layovers in San Francisco and Auckland, New Zealand). 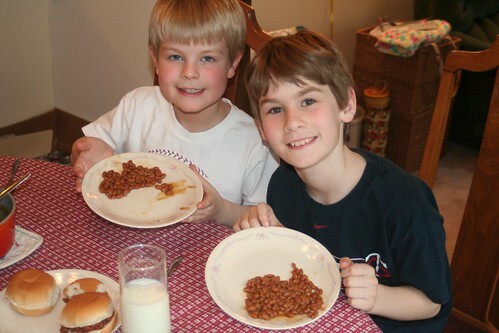 During supper tonight, Karl and Dane arranged their baked beans in the shape of Australia (see photo). Like the popular Arby's restaurant ads, Dane said, "I'm thinking Australia". We've had a poll on the website for the past 4 months asking "Which will arrive first... the Schumachers, their stuff, or both will arrive on the same day?" See the final results here. So, who was right? Well, it depends. For those who suggested that our stuff would arrive first, you can count yourselves victors since our shipping container has been sitting in port at Fremantle/Perth for almost a month now. However, those who guessed that our family would arrive first could argue their case as well now. When we arrive at our house on 28 April, our stuff still will not be there. It's still in port and will be in port for 3 to 4 more weeks while it waits to clear customs. 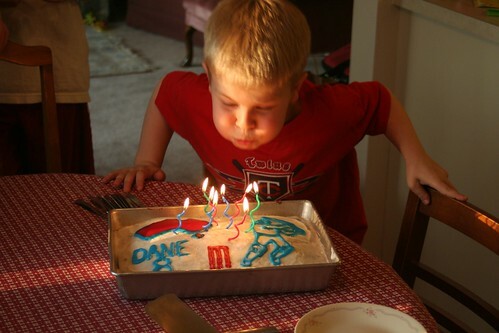 We celebrated Dane's birthday today with Grandma Schumacher and Uncle Mike & family. His actual 8th birthday will be on the day we leave for Australia, so the plane ride may overtake any memories from this week-early celebration. Dane got his wish for a cake with a cricket batsman and a map of Australia. To see more photos from his birthday, login (register first if you haven't) and then visit the photo galleries using the menu in the left margin. and to God who provides for every need. We'll land in Perth at 5:10 am Minneapolis time on Monday and will try to send word of our arrival during the day if possible.